Is that a picture of Spacehawk or the pirate, Gorvak? …I can’t tell. Is that a picture of Spacehawk or the pirate, Gorvak?…I can’t tell. I haven’t read ahead yet to find out, but I can’t wait! I really really hope it’s Spacehawk. How awesome would a sci-fi superhero with a scrotum for a face be as our main protagonist?! I especially dig his crazy Space Mittens. Kind of looks like that Captain America villian with the mask/helmut glued to his face. 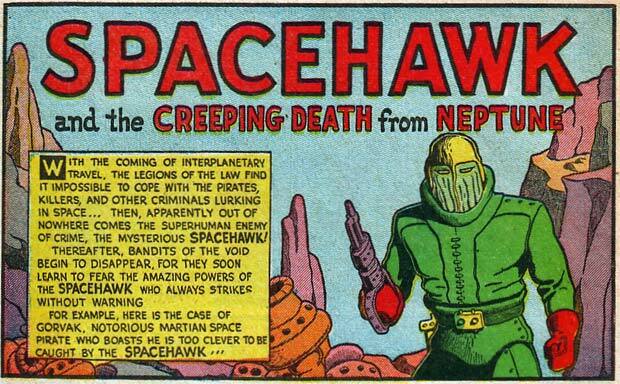 The name Spacehawk made me think of space herpes from Ice Pirates. Why, I do believe that’s Basil Wolverton. Wait a minute. How is Gorvak claiming that he’s too clever to be caught by Spacehawk supposed to be an example of bandits disappearing from being afraid of the legend of spacehawk?